Jesus is located just outside Ibiza town. 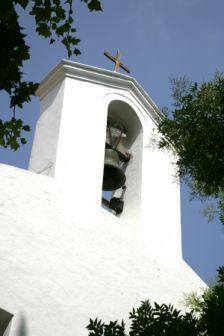 Although Ibiza town is still growing, Jesus remains separated by protected marshlands that run between the two places. These marshlands, known as Ses Feixes, used to be the orchard and vegetable garden for Ibiza. There is an unusual irrigation system, consisting of ditches and underground conduits that supply water to the area, which is what made it so special. If you need somewhere a little more relaxing to spend an afternoon or evening then this could be the ideal place, as there are a large selection of bars and restaurants to choose from. The village is also home to one of the oldest churches on the island. It is a spectacular building with certain solidness to its construction that was typical in 15th century Spain. The church also served as a refuge for the towns folk during pirate attacks. Inside the church is what is said to be the islands greatest work of art. The retable or alter screen is a three paneled painting thought to have been crafted in the early 16th century by Rodrigo de Osona.